The vice mistress of the Rustgates has her long elegant fingers stretched everywhere, and as the Rustgate's main business is scavenging, her thugs, assassins, grifters and hedge wizards can be found in that field as well. Indeed it was Bibi's forces that helped The Gear massacre the Buck Naked cult and fortify their "New Lands". Bibi has also profited from this expansion, bringing the defeated Merrowmen tribe of the buried vault into her service, where the odd eel men craft horrors and wonders out of living flesh to her specifications, not their own. With their numbers growing fast Merrowmen hunters have been reported throughout the hull in search of new creatures to tame and warp for their mistress' power and amusement. Boss Wugg has hunters as well. and his fighting moiety, as well as other bands loyal to the competing great Frogburg Shamans send expeditions into the hull to hunt out resources that will make Frogburg more independent and train young shaman prodigies. These hunters are invariably the most standoffish and clannish of the frogfolk, and they do not like their activities interfered with by outsiders, even other froglings. One must be wary of these bands, for in the hull the buffoonish frogling card reader can call forth a tower of weed choked black water to drown and batter, while the frogling minstrel known for jokes at his race's expense proves adept with poison knives from behind. Brazen Gear has raised an army, devoted to the cause of 'restoring' the Apollyon to an earthly paradise, the former impressed scavenger has grown powerful in his thoughtless and overwhelming faith. His men are much like him forging restlessly ahead, ready to smash aside any obstacle content that they do the work of the spirits. Recently the Fanatics have reclaimed the areas near the buried vault and are building a colony their that they call "the New Lands". Still under siege by the War Dead it is unclear if they can endure. An arm of the Ash Plague, the empire of undeath that grows yearly in the flooded bowels of the Apollyon, the Fishers are a strange lot. Led by the Plague Queen Moabe they do not simply plunder the decaying remains of the great vessel, but claim to "hang like strings of oysters, harvesting new flesh form the deeps". Their appearance belies their submarine nature, as all the Fishers are encrusted with barnacles and weed - kelp ghosts, drowned revenants, animated and decayed leviathans and spirits clad in armored dive suits long sunken beneath the seas. Little is known of their queen, except that her symbol is the hook, and that she has the horrible calm beauty of the newly drowned. Another of the factions of the Ash Plague, known as "One of the Fourteen", but reviled by other Ash Plague creatures, Serkhat supposedly waits in his lair, the Drowned Mansion, somewhere deep in the flooded decks of the stern. The Fishers call him a "tomb beetle" and accuse him of hoarding a silent army of stolen corpses in his watery halls. In quieter words they whisper "Beware the Lion". In the retreat from the midship, pushed by the armies of the Ash Plague, many of Sterntown's residents were lost. Old Stewards will whisper that the gates of Sterntown were not originally set at the Rust Gates, but beyond the buried vault, and that the speed of the Ash Plague's advance trapped a sprawling refugee camp of wounded and sick outside of humanity's defensive lines. These lost are the War Dead, Salt Wraiths that well form the resemblance of lost loved ones, and undead hordes that wish only to "escape" to Sterntown. A secret of the Marines, Sterntown's rear gate is not just protected by the Sigil Maze, of traps and magics, but by the entombed generations of past Marine warriors and assassin. These dead have no allegiance, seeming even to despise the weakness of their distant offspring, they care only about their ancient honor and the protection of duty to prevent passage through their tombs. Little is known about this band of unchained Devils, Malchris insists they are savage and have degenerated from the discipline of true denizen of the pit. The rail baron claims that they have abandoned the sacred ways of contract in their scramble for souls, and if not abandoned at least lost the taste for freely given pledges of self abrogation, sliding into compulsion. Of course, Malchris is a sworn enemy to the Gold Teeth, both because they serve Dispater the Devil lord of magic, and because they hold the fortified rail station between stern and midship that he has schemed and pined for for years. The Duke is a great bloated Devil of bug eyes and electricity, who clearly values himself far above his true station. The patron and perhaps grandfather of the now vanished Haldicar family, Malchris seems willing to deal on good terms with scavengers, but his wishes remain the fierce desire for dominance and corruption native to his kind. Recently Malchris has grown in power acquiring the Haldicar heir as a ward, a armored train, and trading partners that have allowed his forces to expand. Malchris currently seeks powerful souls, petty revenge and advanced weaponry. Languid these Sterntown refugees fester in their carved floating house, served by devils of lethargy and nightmare. They live from the toil of their somnolent slaves, and are hungry for news and trade from the outside. Most recently they have sought advantageous marriages for their comely scions, both from Malchris and beyond. It is likely that even a new strong allegiance will leave the Last House much as it is, but the risk of succeeding is still great for the Last House's veneer of politeness and propriety only feebly conceals untold horrors become routine. A culture, band or city of intelligent rats. A rodent city was discovered hanging form the rafters of the Rust Spire area, where an army of rats with tiny spears and leading giant rat mounts carrying crossbow sized ballista gave gifts to at least one band of adventurers. It unclear how far the empire of these secretive and unobtrusive creatures extends, but they have been seen even in the cellars of uptown, plundering expensive foodstuffs. The Parliment of Tails itself is unknown, but the intelligent rats encountered swear by its puissance and wisdom. At the bottom of the Fetid Pit is a degenerate pack of froglings. Albino, red toothed and led by mad witch doctors these hunters in the dark have little to offer. Most Furious Barking is a huge phasic hound with telepathic, empathic and likely other abilities who leads a large pack of feral hounds. They are the sworn enemies of the Parliment of Tail and have recently expanded their territory due to the success of a band of scavengers at cleaning out the Rust Spire area. furious Barking is intelligent and willing to parley, but he is also resentful and cruel, with the attitudes of a petty tyrant who has a deep disdain for non canines. Deep in the hull, in the armored engine rooms and machine shops, a different class of crewmen survived, and even prospered. For some years they traded with Sterntown and the Fishmen, worshiping strange fire gods and crafting excellent weapons, armor and machines. They are little seen now, but the pallid taciturn giants of the hull's lower reaches undoubtedly still exist, as the marks of their passing in the forms of burnt, crucified corpses, smashed patrols, and doorways welded shut, marked with powerful arcane runes are still discovered from time to time. Little is known about the chaos tainted Fishmen, or Ichthyomorphs as they are properly known. 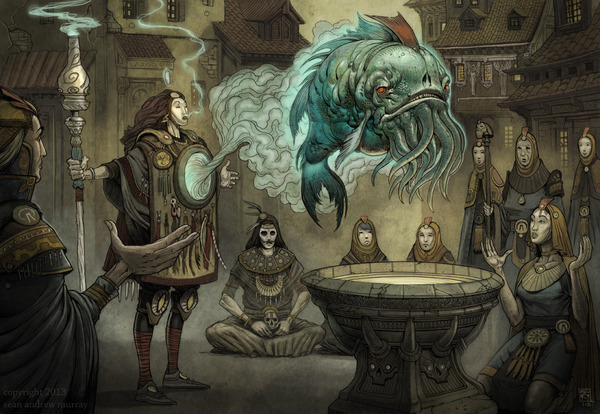 Said to control much of the bow and to rule over a large population of humans, proper Fishmen come in a variety of castes each with distinct physical features, the most powerful being the sorcerer caste of hechiceros. A degenerate and demon worshiping cult of cannibal savages who follow the hyena headed demon prince of slaughter and pain, the Cult of the Ravenous has a clear presence in the Stern, though they have been reduced of late after incursions by Sterntown Scavengers. The Cult's presence just beyond the Rustgates, led by a brute named "Sheriff Buck Naked" and a trio of witches was smashed by Ship Spirit Fanatics and Madam Bibi's militia. A more powerful group of Cult members, led by the enigmatic "Faceless Heirophant" was later driven from their lair in the far starboard reaches of Deck 9, and their fortified home (in a gold plated opera house) burnt. The cult has proven to be tough and bloodthirsty opponents, with heavy conventional weaponry, including boiler mail armors and light artillery to multiply the power of its fanatical warriors, huge hyena beasts, blood elemental summoners and ghoul packs. The Faceless Heirophant is a dangerous foe in her own right, a powerful magician wears a robe of flayed human faces and who appears immune to most normal weapons. The Rustgate's master assassin Manu Stexx has sworn to reward any scavenger who can provide her current location and punish any who kill her before him.